The challenge for the 2nd (very informal) sewcial bee was to sew a garment that was inspired by food. I went for all the greens I eat. I eat lots of kale, brussel sprouts, chard, celery…the list goes on! Remember my birthday breakfast I IG’d? Sauteed kale and quinoa with cultured veggies. I eat this a lot. Gillian was generous enough to send me some green double gauze and I promptly washed it so I could feel how soft it was. 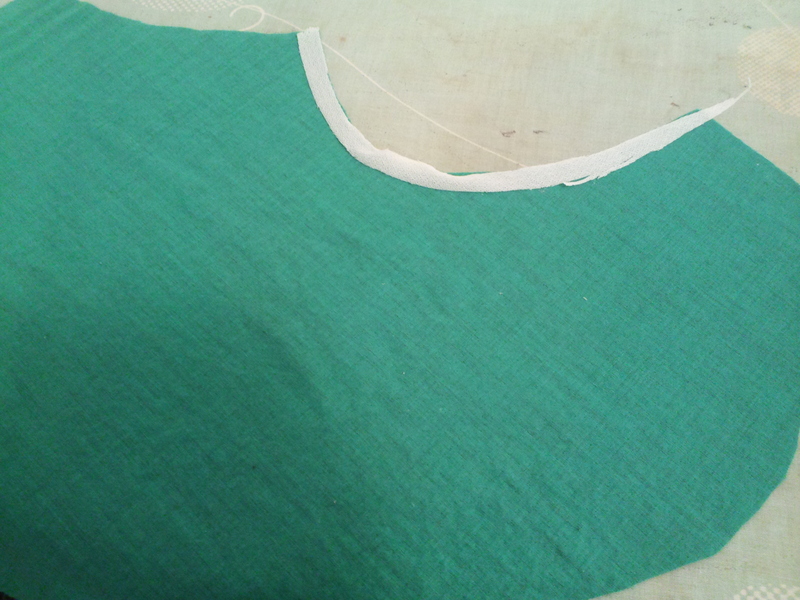 It really is so super soft and now I want to make a ton of garments out of double gauze! When the challenge was announced, I realized I had to do something with this double gauze because it would fit so perfectly with my all greens all the time food options. I’ve been thinking a lot about hacks. I love them so! 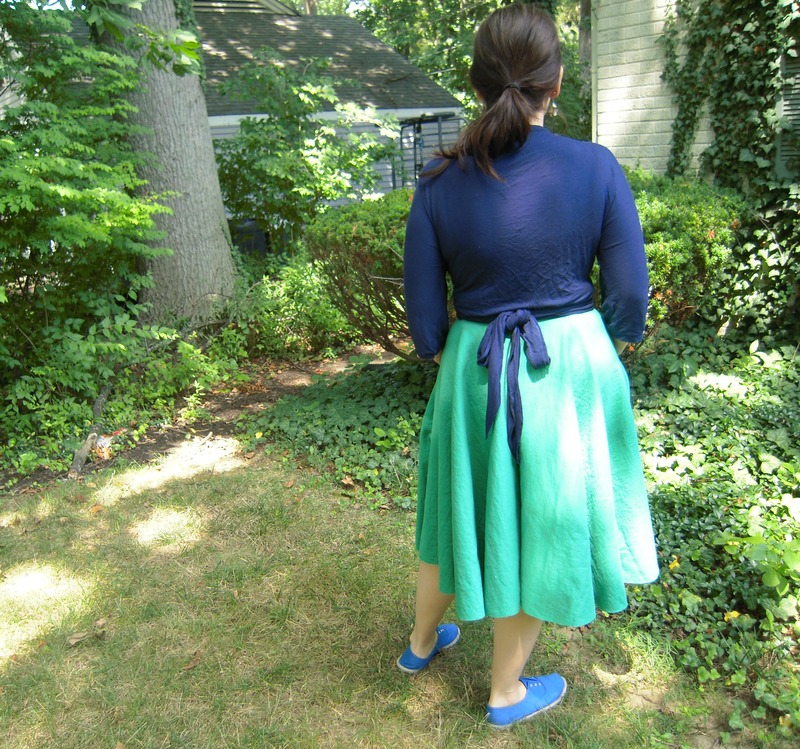 I’ve been wanting to add pockets to the Pavlova skirt- a circle skirt with a patch pocket. 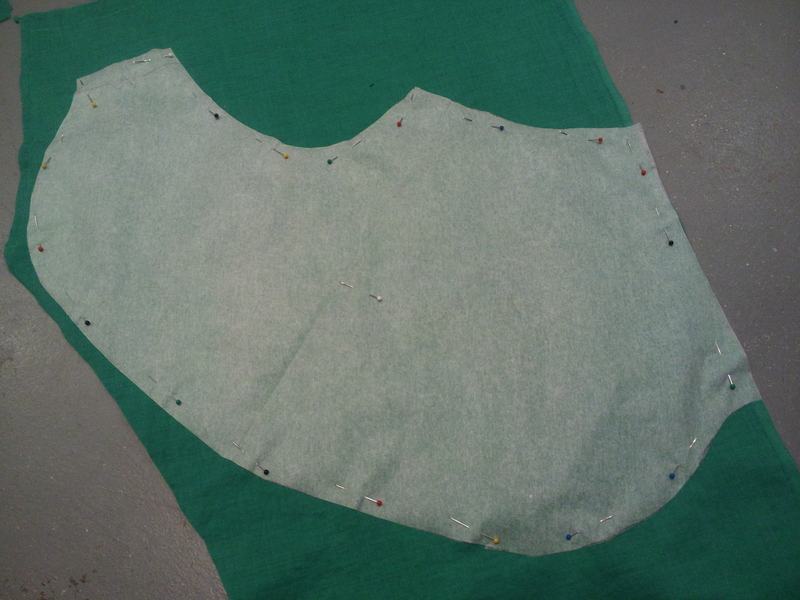 It’s pretty distinct with the seashell patch and I wanted to add other kinds of pockets to test out my drafting skills. 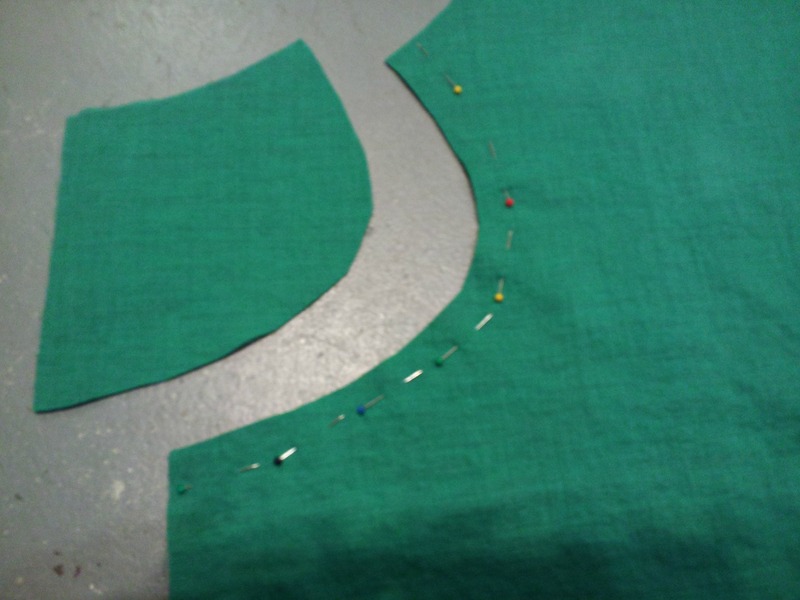 And here’s my process for creating that inset pocket. 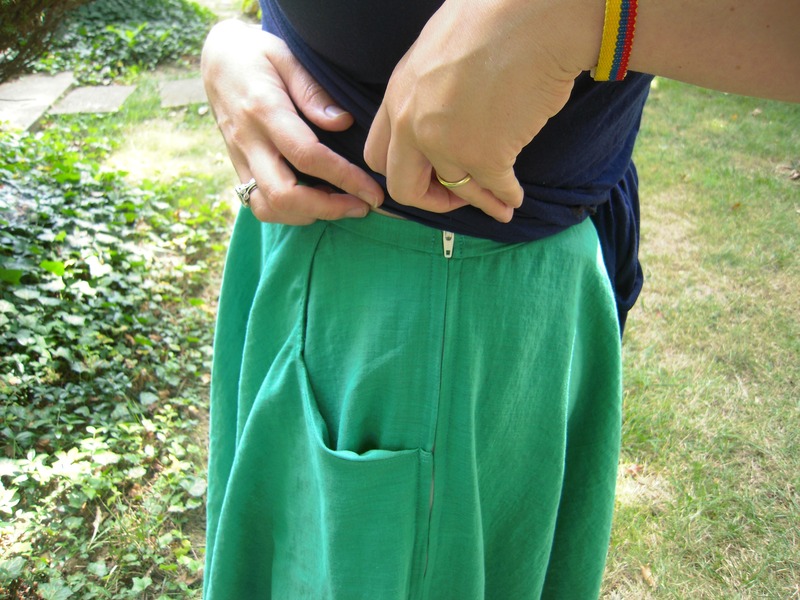 I remember seeing Vintage patterns with the pocket I wanted and I started by scouring the web for tutorials on how to draft this kind of pocket. I popped over to see Rachel’s Hollyburn sewalong which got me thinking I wanted a pocket like the Hollyburn one. I love the Hummingbird pocket that gets folded up to create the pocket bag and the Hollyburn is similar in that it it folded sideways and stitched on the bottom to create the bag. 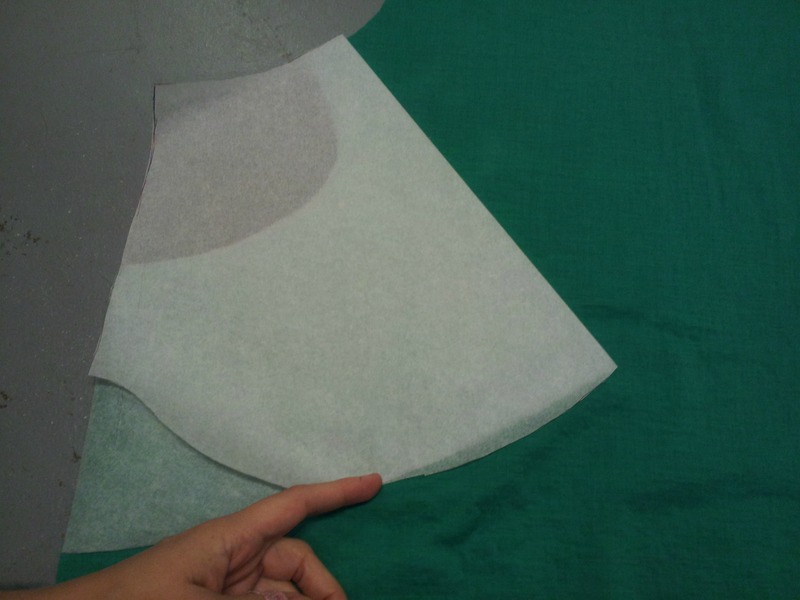 I cut the front on the fold, making sure to leave the pattern hanging over 1/2″ to eliminate the seam allowance. The back pieces were cut as per the pattern instructions. I pinned where I thought I wanted the pocket opening to be and I’d put the skirt up to my body to see if I liked the shape. I fiddled a bit with the opening and then just went with what you see above. 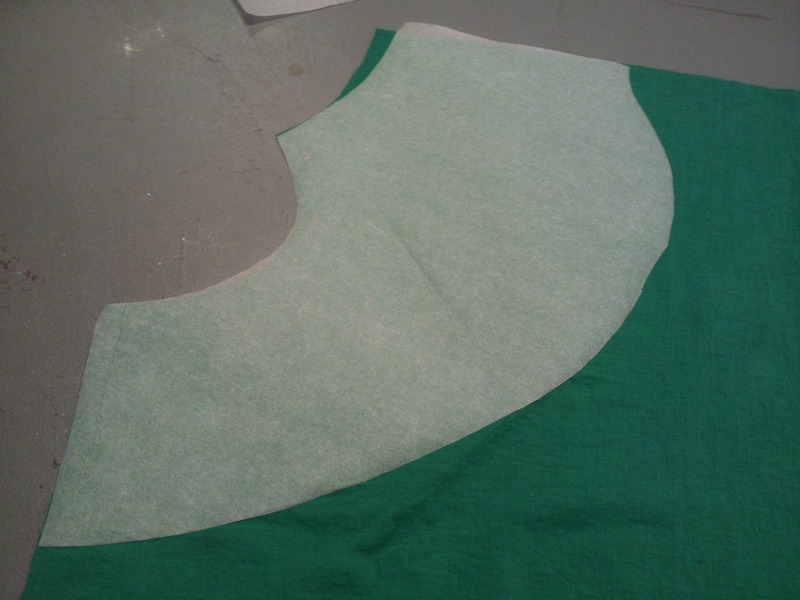 I cut off a curved piece, leaving a seam allowance. I put tracing paper over the pocket opening and drew in part of the pocket bag, as deep as I thought I’d want it. 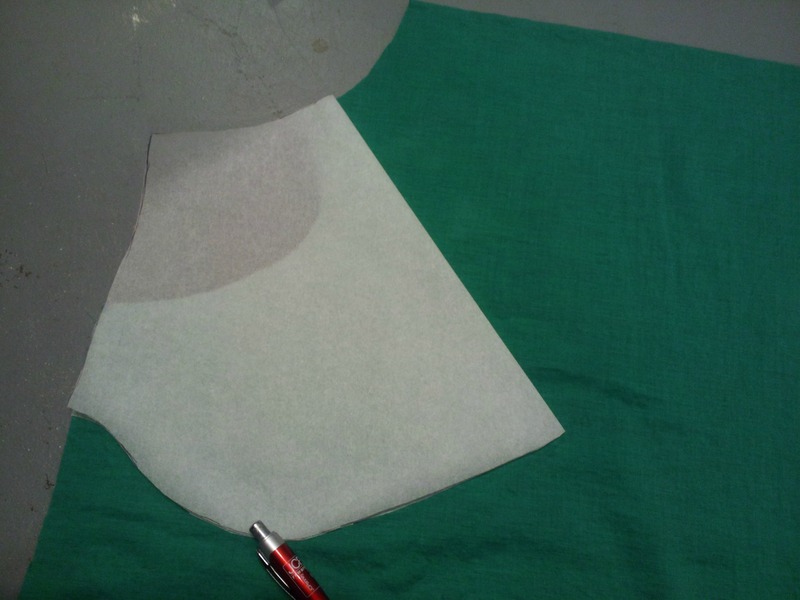 Then came the part where I traced the pocket curve I had just drawn and flipped that piece and put in under a new piece of tracing paper and then retraced the pocket bag and lengthened the bag so I could make a vertical fold and have enough bag to put my hand into. 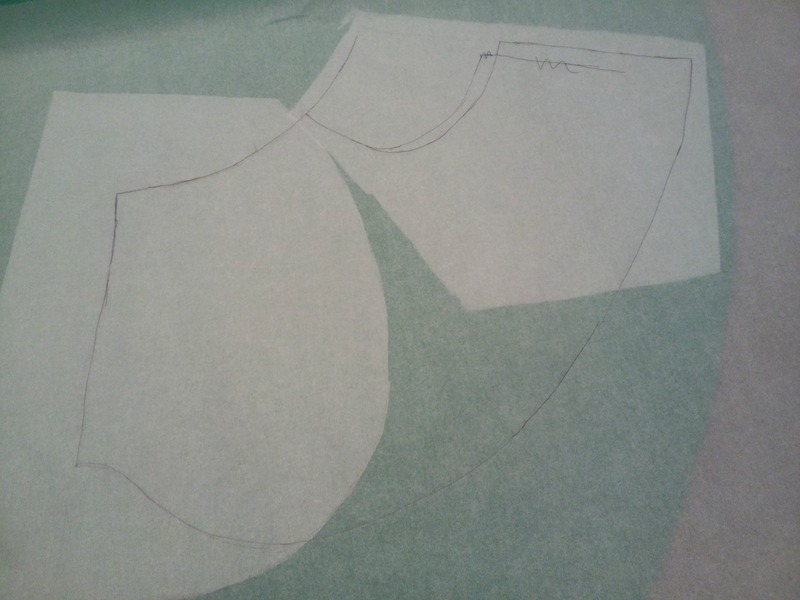 I doubt I explained that well enough so I’m gonna show you my clean tracing of the pocket bag. Here you can see that vertical fold I was talking about. I’m lining up the sides and all I had left to do was clean up my work on the bottom of the bag. I trimmed off the bottom so they would match. Here I am cutting the pocket bag out of fabric. 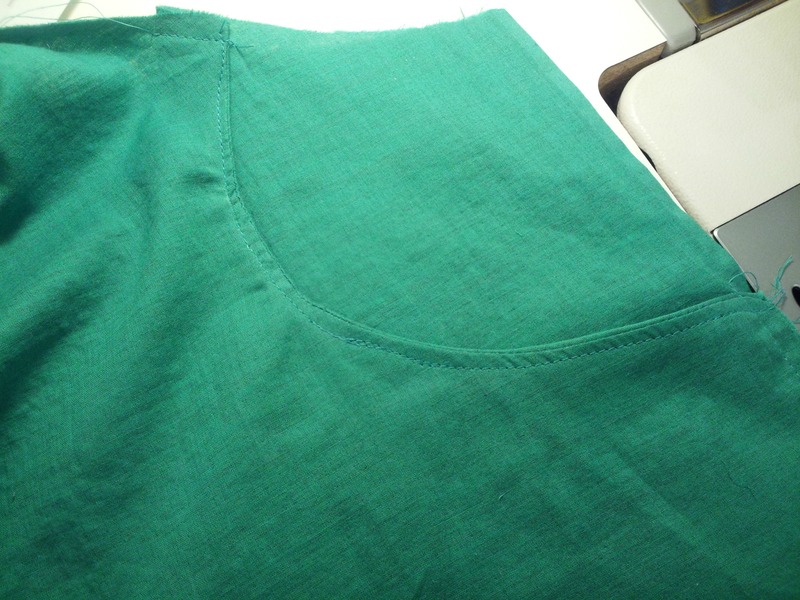 I added knit interfacing to the pocket opening to stabilize it. 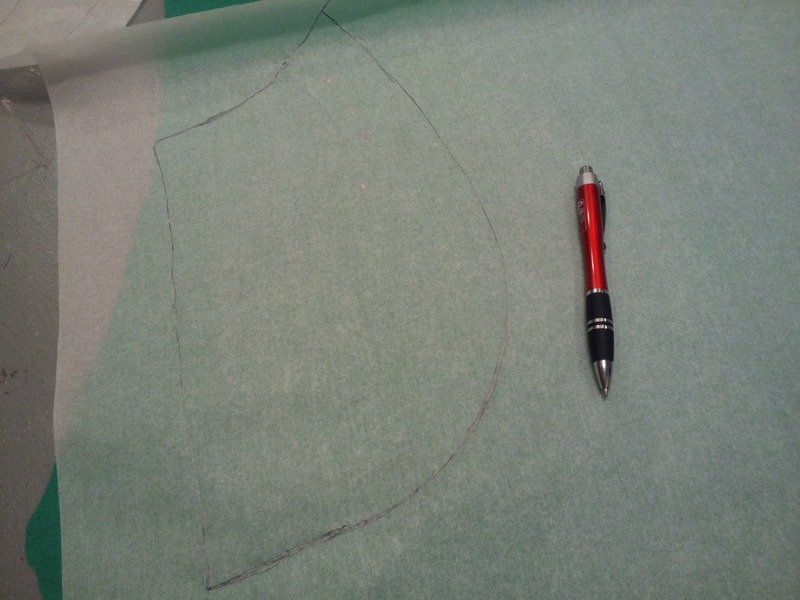 Then, with right sides together, I stitched the curved side to the curve from the skirt, pressed and flipped it over so wrong sides would be together, I understitched on the outside because I wanted a row of stitching but I really should have just topstitched. I’m gonna see if the press holds or if I need to go back and do something about it. Check Rachel’s Hollyburn tutorial for more detailed photos on how to put this kind of pocket together. Oh, and I swear the other side is stitched way better. Where is my sewing fu? I probably used it up drafting up the pocket. I love this pocket and I can see myself using it on the Tiramisu dress and other Pavlova skirts. I know I’ll be spending time looking at vintage pockets tonight. Any details drawing your attention? I love your skirt – such a pretty color! Looks really great with the top too! My husband does the same thing to me – lol! He silently takes pics and then I ask “aren’t you going to take anything? ?” when he already has a ton of goofy expressions. Nice pockets! 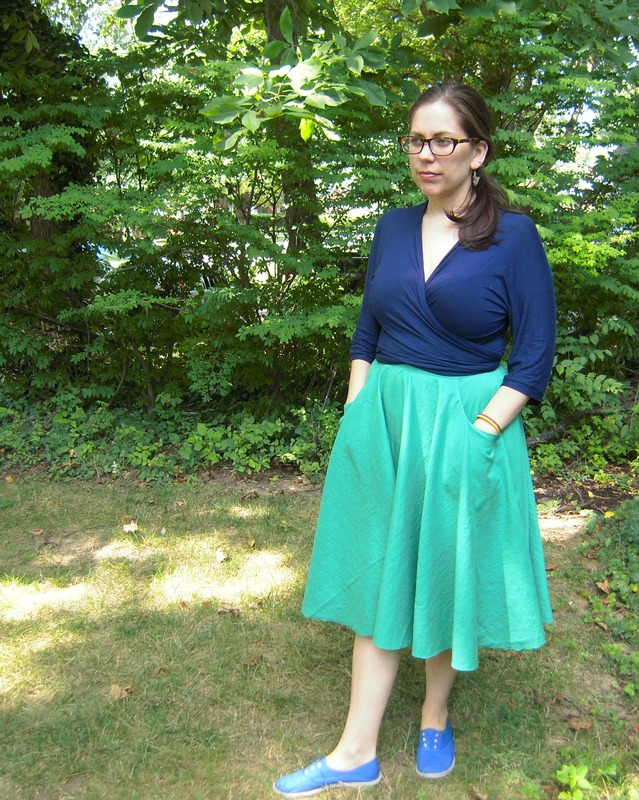 I’ve made some bias skirts that didn’t have pockets and wished they did have them. But those skirts didn’t have a waistband – just a facing. Your wrap top looks great. Love the colors of the top and skirt! Such a great skirt! My favorite color is green, although I probably don’t eat as many green veggies as you (shame on me). I love the pockets, I would rock this all over town! You are really tempting me to get some double gauze! My friend is headed to Japan in 3 weeks and she is willing to pick up some fabric for me. I hope I can get some! oooh, you should totally try to get some. I’m loving this stuff! 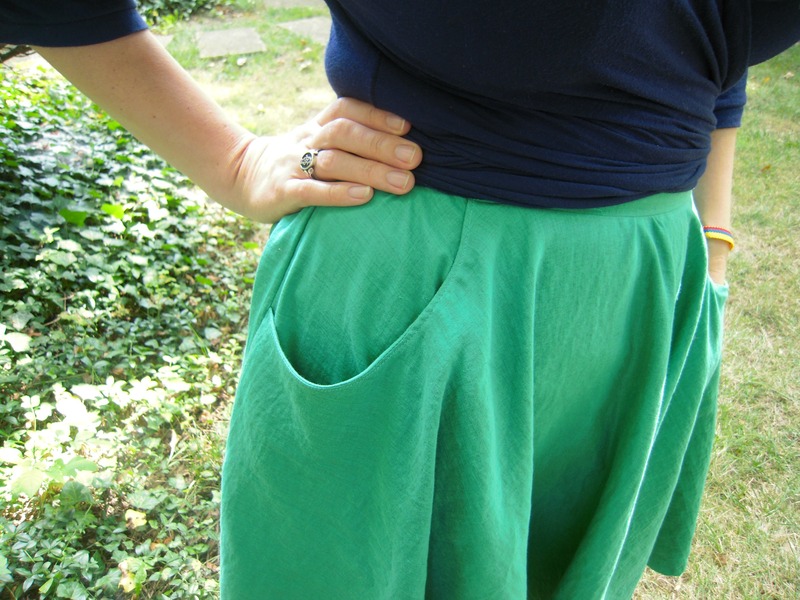 Pockets on a circle skirt- I get it now! I just couldn’t picture it, but it’s lovely! Thanks. I’m not sure I knew how to describe them. I think these are inset pockets but my brain no function sometimes. Love the pockets on the skirt. And the gauze is perfect for this type of skirt and such a pretty color. Definitely reminds me of veggies! I did not know what cultured vegetables were so I had to google. I love saurkraut and pickles. Now I am craving them! Do pickled beets count? They are my FAVE! From what I’m learning, pickles aren’t cultured veggies. Check out bodyecology.com for more info on cultured veggies. Easy to make at home, too. But I’m pretty sure you can put anything into your cultured veggies ( just not tomatoes). Yummy, indeed. 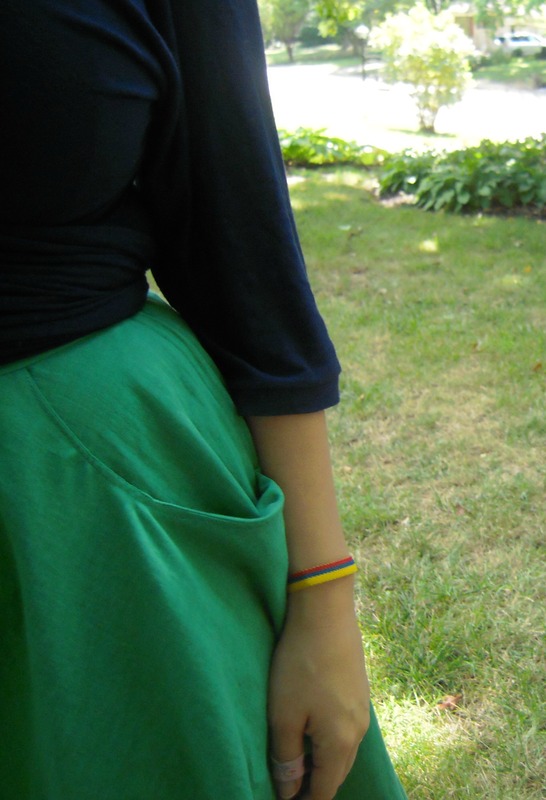 Lovely skirt, with great pockets, green with envy here. thank you! It’s a fun pattern. the seashell pocket that comes with the pattern is so cute! But I had to have more pockets! I agree with you on the pockets. I’ve got to the stage where I simply can’t live without them. Oh, I know what you mean! Garments without pockets seem so lacking. I’m really eager to try an invisible zipper. The kind that uses an invisible zipper at a seam. I do indeed. The Husband bought me an Otterbox to protect my new phone. It’s earning its keep. I’m a klutz! My husband is the one that drops everything. He also runs into stuff all the time at home. Poor guy. After he runs into something he quotes the movie Clue and says, “I’m a little accident prone.” Makes me laugh every time. Very cute skirt Leila! Looks so comfy and stylish all at the same time. I had to study for my patternmaking final exam (was on Wednesday, so it’s OVER now!! ), so could not participate in the sewcial bee this time. But, looking forward to the next one!